Earthquakes in the Himalayas regularly cause landslides that block rivers (Image by Yang Yong). 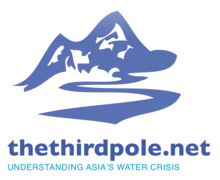 This is part of a special series of articles produced by our sister site thethirdpole.net on the future of the Yarlung Tsangpo river - one of the world's great transboundary rivers - which starts on the Tibetan Plateau before passing through India and Bangladesh. In October 2012, Indians learned that China had begun to construct a 700 megawatt (MW) capacity dam on the Brahmaputra river (Yarlung Tsangpo). The news aroused fears that China intended not only to generate power from the river but also divert some of its waters to the arid northern regions of the country. This possibility was first mentioned at the international conference of the Global Infrastructure Fund in Anchorage, Alaska, in 1986. Although Chinese officials rubbished the idea as being impossibly expensive to implement, they did not rule out the possibility of constructing dams on the river to generate power. This ambivalence raised understandable alarm in Bangladesh and India, but Beijing sought to allay their fears by assuring them that it intends to build run-of-the-river dams that will redirect, but not stop, the flow of its waters into India and Bangladesh. These reassurances have not, however, prevented China and India from entering into an undeclared race to capture the hydroelectric potential of the Yarlung Tsangpo river basin. Chinese writers began to air plans for harnessing the Yarlung Tsangpo in 2005, but it is possible that the Indian government had already begun to formulate its plans after the publication of a book by Li Ling in 2003 entitled Tibet’s waters will save China. As the downstream riparian, India is hoping to establish first user rights to stake its claim to an uninterrupted flow of the Yarlung Tsangpo’s waters. In international law, first user rights start upon the completion of a project, so the number of projects that India has signalled it will take up in the Brahmaputra basin has risen rapidly – from 146 announced in a 10-year hydroelectricity plan unveiled by India’s Central Electricity Authority in 2007, to about 200 today. What is more, a scramble has developed to start as many of these as soon as possible. The pace of planning and implementation has also picked up in China. Citing the need to cut down carbon dioxide emissions, the 12th Five Year energy plan, shifted its emphasis back onto giant hydroelectric projects once more. One of its most important goals is to harness the hydropower potential of the Yarlung Tsangpo basin. In all, China intends to build 40 dams on the river and its tributaries. Of these, 20 dams on the Yarlung Tsangpo will generate 60,000 MW of power, while 20 smaller dams upon its tributaries are expected to generate another 5,000 MW. Eleven of the 20 projects on the Yarlung Tsangpo will be located between its source and the Great Bend where the Yarlung Tsangpo turns northwards, executes a huge ‘U’ turn and falls from 3,500 metres on the Tibetan plateau to 700 metres in the undulating hills of Arunachal Pradesh in India. These will generate 20,000 MW of power, while the balance of 40,000 MW will be generated at the Great Bend itself. The plan for doing this has been put forward by ex-premier Li Peng’s family-dominated corporation, the Three Gorges Dam Company. It envisages building a vast tunnel under the ridge that separates the two arms of the Great Bend to divert 50 billion cubic metres of water a year from the northwestern flowing arm of the river to the south-eastern arm over a succession of nine cascading hydropower dams that will generate 40,000 MW of power. India, for its part, plans to generate 22,000 MW from two large dams on the Yarlung Tsangpo in Arunachal Pradesh and 10,000 MW from dams on its tributaries. In all, therefore, the two countries plan to generate 97,000 MW of power from this tiny region of their respective countries. Such ambitious but conflicting plans were bound to have political repercussions. The first was a statement by the Chinese ambassador in New Delhi that China considered the whole of the northeastern state of Arunachal Pradesh to be a part of Tibet. This was a reversal of its earlier position, developed in a succession of bilateral negotiations since 1994, that China was prepared to settle for a substantial modification of some parts of the existing temporary boundary, called the Line of Actual Control. The announcement took the Indian government by surprise and was followed by three years of rising tension along the border. China began to refer to Arunachal as “South Tibet”, and to its principal monastery at Tawang as Tibet’s second most important monastery after Lhasa. It also began to deny visas to Indian officials who were serving in Arunachal Pradesh. The tension was not defused until there was a meeting between then premier Wen Jiabao and prime minister Manmohan Singh, at Hua Hin, Thailand, in October 2009, designed specifically to prevent its spilling over into military conflict. These plans are engineers’ dreams run amok. If they have their way, up to 360 dams will be built on slopes with a gradient of as much as 60 degrees, at the meeting point of three of the youngest and most unstable mountain ranges in the world. But neither the Chinese nor the Indian government have made even a rudimentary assessment of the impact that gouging out billions of cubic metres of rock and earth to build dams, tunnels and roads, and store millions, in some cases billions, of cubic metres of water, will have on the stability of the earth’s crust in this region. Both governments know that the Himalayas have experienced the most powerful earthquakes on land in recorded history. Four of these, measuring 7.8 to 8.9 on the Richter scale, occurred within a span of 53 years between 1897 and 1950. The first and last occurred in the region immediately south and west of the Great Bend in the Yarlung Tsangpo. The 1897 earthquake measured 7.8 on the Richter scale (equivalent to the explosion of 7.6 million tonnes of dynamite, or a medium sized hydrogen bomb) and caused widespread damage and loss of life in what was then called Upper Assam. It was caused by the build up of pressure as the Indian (tectonic) plate pressed against the Shillong Plate, a part of the far older Eurasian Plate. The 1950 earthquake was the strongest ever recorded in the Himalayas. It occurred at Rima, in Tibet, not far from the site of the 1897 quake. Measuring 8.7 on the Richter scale, it is one of the 10 most severe earthquakes in recorded history. Its epicentre also lay on the fault line where the Indian continental plate smashes into the Eurasian plate. Survivors from the region reported mudslides damming rivers and causing giant floods that brought down sand, mud, trees, giant boulders and all kinds of debris. These were neither isolated nor exceptional events. Earthquakes in the Himalayas regularly cause landslides that block rivers, causing them to rise until the pressure of the stored water breaks through. The result is a flash flood downstream that brings havoc to the villages and towns that lie in its path. The avalanches caused by the 1950 earthquake blocked several of the tributaries of the Yarlung Tsangpo. One such dyke in the Dibang valley broke quickly and caused relatively little damage. But another, at Subansiri, broke only after water had collected behind it for eight days and unleashed a seven-metre-high wave that submerged several villages and killed 532 people. Geological studies, including the radio carbon dating of sand found on the surface, have uncovered at least one other giant earthquake in the same area in 1548, and two others in the central region of the Himalayas that were severe enough to rupture the earth’s surface. The first of these occurred in 1255. The second was the devastating Bihar earthquake of 1934. The 1934 earthquake, which measured 8.1 on the Richter scale had its epicentre about 10 kilometres south of Mount Everest. It devastated the northern part of the Indian state of Bihar and large parts of eastern Nepal, and killed at least 30,000 people. This was the death toll when there were no dams in the mountains. The dykes that the landslides created were made of mud and boulders, and they broke in a matter of days. But earthquakes of this magnitude will almost certainly crack concrete dams as well. The Richter scale is a logarithmic scale, which means that an 8.1 magnitude earthquake releases three times as much energy as a 7.8 magnitude quake. For an 8.7 magnitude quake, it's 23 times as much. Should any of the giant dams contemplated by the two countries crack during an earthquake, the colossal wave of water, mud and boulders released would kill millions of human beings and devastate tens of thousands of square miles of the downstream areas of Tibet, India and Bangladesh. The overwhelming majority of deaths would take place in India and Bangladesh. India got a taste of what a flash-flood upriver in the Yarlung Tsangpo basin could do when one wiped out an entire island in the Brahmaputra in 2000, killing nearly all who lived on it, and another in June 2013, when a landslide caused by three days of incessant rain blocked a tributary of the Bhagirathi river, one of the two main tributaries of the Ganges. When the dyke it had created broke on the third day, the resulting flash-flood destroyed the entire pilgrimage town of Kedarnath and killed between 5,000 and 10,000 pilgrims in a matter of hours. Had the hillsides overlooking the Bhagirathi not been ravaged by the construction of dams and tunnels for the Tehri hydroelectric project, this catastrophe might not have happened. The Tehri project is a pygmy compared with the nine-cascade project proposed for the Great Bend, as its generating capacity is only 1,000 MW. The death toll from the fracture of even one of these dams would, therefore, run into millions. If the two governments go through with their plans for the Brahmaputra–Yarlung Tsangpo basin, the entire region will become a calamity waiting to happen.